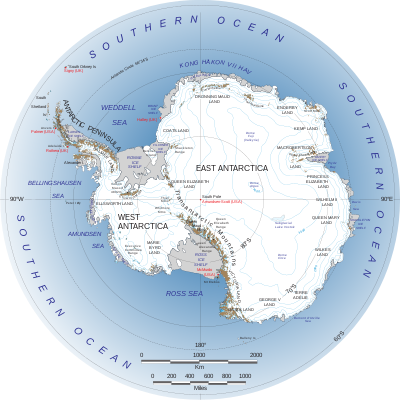 Physically, Antarctica is divided in two by Transantarctic Mountains close to the neck between the Ross Sea and the Weddell Sea. Western Antarctica and Eastern Antarctica correspond roughly to the eastern and western hemispheres relative to the Greenwich meridian. This usage has been regarded as Eurocentric by some, and the alternative terms Lesser Antarctica and Greater Antarctica (respectively) are sometimes preferred. Lesser Antarctica is covered by the West Antarctic Ice Sheet. There has been some concern about this ice sheet, because there is a small chance that it will collapse. If it does, ocean levels would rise by a few metres in a very short period of time. Volcanoes that occur underneath glacial ice sheets are known by the term "Glaciovolcanism", or subglacial volcanoes. An article published in 2017 claims that researchers from Edinburgh University recently discovered 91 new volcanoes below the Antarctic ice sheet, adding to the 47 volcanoes that were already known. As of today, there have been 138 possible volcanoes identified in West Antarctica. There is limited knowledge about West Antarctic Volcanoes due to the presence of the West Antarctic Ice Sheet, which heavily covers the West Antarctic Rift System -- a likely hub for volcanic activity. Researchers find it difficult to properly identify volcanic activity due to the comprehensive ice covering. East Antarctica is significantly larger than West Antarctica, and similarly remains widely unexplored in terms of its volcanic potential. While there are some indications that there is volcanic activity under the East Antarctic Ice Sheet, there is not a significant amount of present information on the subject. Mount Erebus is one of the most notable cites in the study of Antarctic Volcanism, in that it is the southernmost historically active volcanic cite on the planet. Deception Island is another active Antarctic volcano. It is one of the most protected areas in the Antarctic, given its situation between the South Shetland Islands and the Antarctic Peninsula. As the most active volcano in the Antarctic peninsula, it has been studied closely since its initial discovery in 1820. There are four volcanoes on the mainland of Antarctica that are considered to be active on the basis of observed fumarolic activity or "recent" tephra deposits: Mount Melbourne (2,730 m) (74°21'S., 164°42'E. ), a stratovolcano; Mount Berlin (3,500 m) (76°03'S., 135°52'W. ), a stratovolcano; Mount Kauffman (2,365 m) (75°37'S., 132°25'W. ), a stratovolcano; and Mount Hampton (3,325 m) (76°29'S., 125°48'W. ), a volcanic caldera. Several volcanoes on offshore islands have records of historic activity. Mount Erebus (3,795 m), a stratovolcano on Ross Island with 10 known eruptions and 1 suspected eruption. On the opposite side of the continent, Deception Island (62°57'S., 60°38'W. ), a volcanic caldera with 10 known and 4 suspected eruptions, have been the most active. Buckle Island in the Balleny Islands (66°50'S., 163°12'E. ), Penguin Island (62°06'S., 57°54'W. ), Paulet Island (63°35'S., 55°47'W. ), and Lindenberg Island (64°55'S., 59°40'W.) are also considered to be active. In 2017, the researchers of Edinburgh University discovered 91 underwater volcanoes under West Antarctica. The definition of Glaciovolcanism is “the interactions of magma with ice in all its forms, including snow, firn and any meltwater.” It defines a special field of volcanic that is specifically centered around ice and ice melt. This field of science is less than 100 years old, and thus continuously makes new discoveries. Glaciovolcanism is characterized by three kinds of eruptions: sub-glacial eruptions, supraglacial volcanism, and ice-marginal volcanism. The study of glaciovolcanism is vital to the understanding of ice sheet formation. It is also a valuable tool to predict volcanic hazards, such as the ash hazard following the Eyjafjallajökull eruption in Iceland. The Marie Byrd Land is an incredibly large portion of West Antarctica, consisting of the Area below the Antarctic Peninsula. The Marie Byrd land is a large formation of volcanic rock, characterized by 18 exposed and subglacial volcanoes. 16 of the 18 volcanoes are entirely covered by the antarctic ice sheet. There have been no eruptions recorded from any of the volcanoes in this area, however scientists believe that some of the volcanoes may be potentially active. Scientists and researchers debate whether or not the 138 identified possible volcanoes are active or dormant. It is very hard to definitively say, given that many of these volcanic structures are buried underneath several kilometers of ice. However, ash layers within the West Antarctic Ice Sheet, as well as deformations in the ice surface indicate that the West Antarctic Rift System could be active and contain erupting volcanoes. Additionally, seismic activity in the region hints at magma movement beneath the crust, a sign of volcanic activity. Despite this, however, there is not yet definitive evidence of presently active volcanoes. Subglacial volcanism is often characterized by ice melt and subglaical water. Though there are other sources of subglacial water, such as geothermal heat, it almost always is a condition of volcanism. Scientists remain uncertain about the presence of water underneath the West Antarctic Ice Sheet, with some claiming to have found evidence indicating the existence. In West Antarctica's Marie Byrd Land, volcanoes are typically composed of alkaline and basaltic lava. Sometimes, the volcanoes are entirely basaltic in composition. Due to the geographic similarity of the Marie Byrd Land, it is believed that the volcanoes in the West African Rift System are also composed of basalt. Above-ice basaltic volcanoes, also known as subaerial basaltic volcanoes, generally form in tall, broad cone shapes. Since they are formed from repeated piling of liquid magma sourced from the center, they spread widely and grow upwards relatively slowly. However, West Antarctic Volcanoes form underneath ice sheets, and are thus categorized as subglacial volcanoes. Subglacial volcanoes that are monogenetic are far more narrow, steeper, flat topped structures. Polygenetic subglacial volcanoes have a wider variety of shapes and sizes due to being made up of many different eruptions. Often, they look more cone shaped, like statovolcanoes. Little has been studied about the implications of volcanic ash from eruptions within the Antarctic Circle. It is likely that an eruption at lower latitudes would cause global health and aviation hazards due to ash disbursement. The clockwise air circulation around the low pressure system at the South Pole forces air upwards, hypothetically sending ash upwards towards the Stratospheric jet streams, and thus quickly dispersing it throughout the globe. Recently, in 2017, a study found evidence of subglacial volcanic activity within the West Antarctic Ice Sheet. This activity poses a threat to the stability of the Ice Sheet, as volcanic activity leads to increased melting. This could possibly plunge the West Antarctic Ice Sheet into a positive feedback loop of rising temperatures and increased melting. There are three vast canyons that run for hundreds of kilometers, cutting through tall mountains. None of the canyons are visible at the snow-covered surface of the continent since they are buried under hundreds of meters of ice. The largest of the canyons is called Foundation Trough and is over 350km long and 35km wide. The Patuxent Trough is more than 300km long and over 15km wide, while the Offset Rift Basin is 150km long and 30km wide. These three troughs all lie under and cross the so-called "ice divide" - the high ice ridge that runs all the way from the South Pole out towards the coast of West Antarctica. West Antarctica on the left. Typical landscape for the Antarctic Peninsula area, with fjords, high coastal mountains and islands. Click on the image for geographical details. For all ice shelves see List of Antarctic ice shelves. For a list of all Antarctic islands see List of Antarctic and sub-Antarctic islands. East Antarctica on the right. For a list of all antarctic research stations, see Research stations in Antarctica. 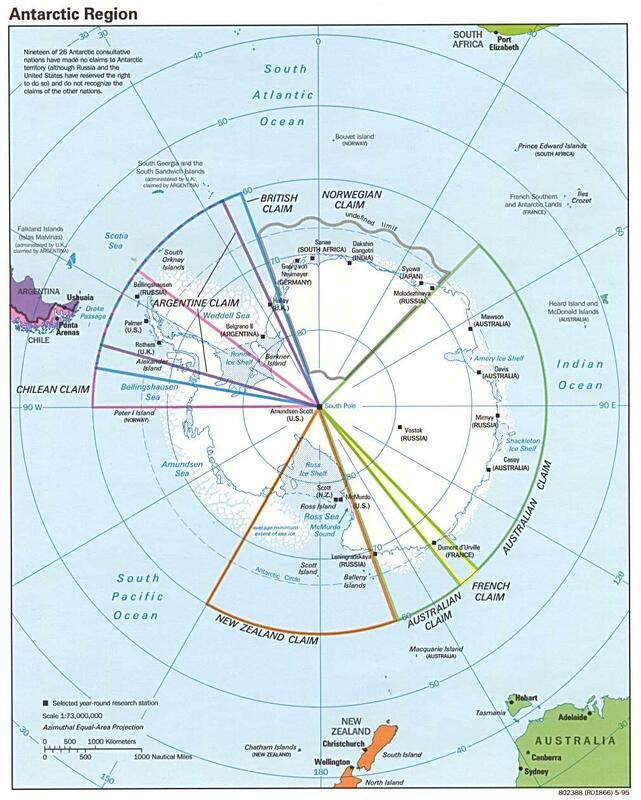 Seven nations have made official Territorial claims in Antarctica. ^ "91 volcanoes discovered beneath Antarctica's ice. But are they active?". USA TODAY. Retrieved 2019-01-18. ^ van Wyk de Vries, M., Bingham, R. G. & Hein, A. S. A new volcanic province: an inventory of subglacial volcanoes in West Antarctica. Geol. Soc. Lond. Spec. Publ. 461 (2017). ^ Hein, Andrew S.; Bingham, Robert G.; Vries, Maximillian van Wyk de (2018-01-01). "A new volcanic province: an inventory of subglacial volcanoes in West Antarctica". Geological Society, London, Special Publications. 461 (1): 231–248. doi:10.1144/SP461.7. ISSN 0305-8719. ^ "Global Volcanism Program | Erebus". volcano.si.edu. Retrieved 2019-03-14. ^ McKie, Robin (2017-08-12). "Scientists discover 91 volcanoes below Antarctic ice sheet". The Guardian. ISSN 0261-3077. Retrieved 2017-08-16. ^ "Student's idea leads to Antarctic volcano discovery". The University of Edinburgh. Retrieved 2017-08-16. ^ Smellie, 2000. Subglacial eruptions. In: Sigurdsson, H. (ed.) Encyclopaedia of Volcanoes. Academic Press, San Diego, pp. 403-418. Smellie, 2006. The relative importance of supraglacial versus subglacial meltwater escape in basaltic subglacial tuya eruptions: an important unresolved conundrum. Earth-Science Reviews, 74, 241-268. ^ "What is Glaciovolcanism?". WorldAtlas. Retrieved 2019-02-19. ^ Winberry, J. P. & Anandakrishnan, S. Crustal structure of the West Antarctic rift system and Marie Byrd Land hotspot. Geology 32, 977–980 (2004). ^ LeMasurier, W. E. Neogene extension and basin deepening in the West Antarctic rift inferred from comparisons with the East African rift and other analogs. Geology 36, 247–250 (2008). ^ Iverson, N. A. et al. The first physical evidence of subglacial volcanism under the West Antarctic Ice Sheet. Sci. Rep. 7, 11457 (2017). ^ Behrendt, J. C., Finn, C. A., Blankenship, D. D. & Bell, R. E. Aeromagnetic evidence for a volcanic caldera complex beneath the divide of the West Antarctic ice sheet. Geophys. Res. Lett. 25, 4385–4388 (1998). ^ King, E. C., Woodward, J. & Smith, A. M. Seismic evidence for a water-filled canal in deforming till beneath Rutford Ice Stream, West Antarctica. Geophys. Lett. 31 (2004). ^ "Types of Volcanoes". volcano.oregonstate.edu. Retrieved 2019-01-28. ^ Geyer, Adelina; Marti, Alejandro; Folch, A.; Giralt, Santiago (2017-04-23). "Antarctic volcanoes: A remote but significant hazard". arXiv:1502.05188. doi:10.13039/501100003329. hdl:10261/162118. ^ Golden, Ellyn; Kim, Ellen; Rachel Obbard; Dunbar, Nelia W.; Lieb-Lappen, Ross; Iverson, Nels A. (2017-09-13). "The first physical evidence of subglacial volcanism under the West Antarctic Ice Sheet". Scientific Reports. 7 (1): 11457. doi:10.1038/s41598-017-11515-3. ISSN 2045-2322. PMC 5597626. PMID 28904334. ^ Winter, Kate; Ross, Neil; Ferraccioli, Fausto; Jordan, Tom A.; Corr, Hugh F. J.; Forsberg, René; Matsuoka, Kenichi; Olesen, Arne V.; Casal, Tania G. (2018-05-28). "Topographic Steering of Enhanced Ice Flow at the Bottleneck Between East and West Antarctica". Geophysical Research Letters. 45 (10): 4899–4907. doi:10.1029/2018GL077504.